LG this week revealed two new mid-range Android phones with LTE 4G: the F70 and F90. At the Mobile World Congress trade show in Barcelona this week, they showed off a Sprint version of the F90, which seems to be called the Volt. The Volt has a 4.7-inch qHD display, 8-megapixel main camera, front camera, Snapdragon 400 processor, NFC, removable 3,000 mAh battery, tri-band LTE (Sprint Spark,) IR remote control, and a memory card slot. The software includes LG's QSlide, Knock Code, and Smart screen, which keeps the screen from timing out while you're looking at it. It ships with Android Kit Kat 4.4. Pricing and release date were not announced. The F70 is a smaller cousin to the F90. 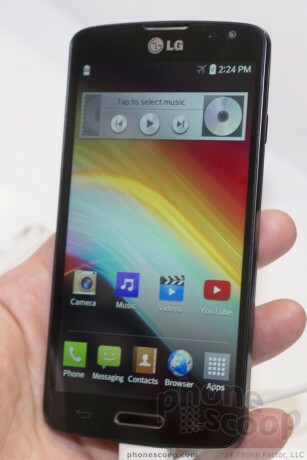 It has a 4.5-inch display, 5-megapixel camera, and a smaller battery, but is otherwise identical.